Sales of existing homes continued their downward slide though at a slower pace according to the National Home Sales Snapshot released by DataQuick while home values slipped another $1500. There were 248,817 properties sold over the previous thirty-day rolling period ending October 17th, down 0.6 percent from the previous week’s total of 250,006 sold properties and 4.4 percent lower than the 260,238 properties sold four weeks ago. Sales volume was 7.8 percent below this year’s cycle peak of 269,817 sales which occurred during the 30-day rolling period prior to September 12th of this year. Last week’s home sales volume was still 15.8 percent higher than the 214,545 homes sold during the same period a year ago and was 52.6 percent higher than during the same period three years ago when 162,808 homes were sold. The median price of a home sold over the current thirty-day rolling period decreased by $1,500 to $223,500 after falling by $2,000 the week before. 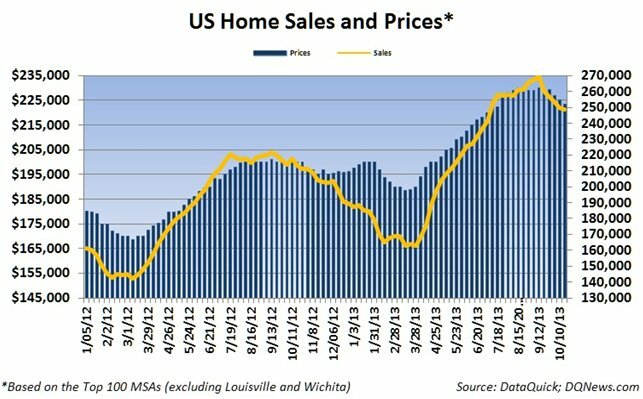 Four weeks ago the median home price was $228,500. Home prices were still 11.8 percent higher than during the same period a year ago when the median price of a home was $200,000 and were 15.2 percent higher than the median price of $194,000 during the same period three years ago.